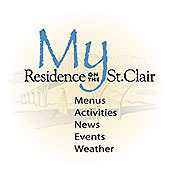 For the staff members of Residence on the St. Clair, this is not just a job. It’s a community where we have friends and family, in which we happen to work. "One of the most rewarding parts of my job is getting to know and build relationships with our residents and their family members, and helping them to make the transition as easy as possible."